So I guess I should announce that I got a new job as a writer/reporter for a new start-up website. This is super exciting for me as it would be my first “career” position and the title just puts a great smile on my face. Really though, would you capture the opportunity or be too afraid to take it? I took it! “The moment, you own it, you better never let it go. You only get one shot, do not miss your chance to blow. You never know what life will bring you, so take chances, take the risk and see how life unfolds. “Success is my only motherfucking option, failure’s not” … Self explanatory. “You can do anything you set your mind to, man”… or woman! You do you! And while you’re at it achieve those goals. Nail art is trending and it is not going away any time soon. More and more creative designs are thought of each day and posted on Instagram, Pinterest and Tumblr. With millions of ways to trendify your nails it’s hard not to get overwhelmed and switch your look every week, if not day! Cosmetic lines are quick to jump on the nail art craze with nail stickers for those who aren’t as nimble with their hands, like myself. There are so many different things that you could do and add to your fingertips to dazzle them up. Some of my favorite looks that I searched online are included below. 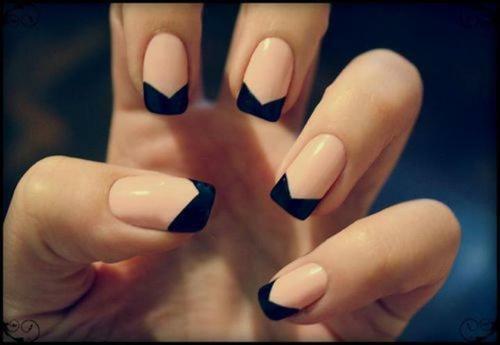 Such as the one on the left, a simple twist on the french manicure with a black triangle cut style is just clean and solid looking. I am obsessed with the matte finish nail polish. You can buy them in an array of different colors or get a clear polish that will turn any of your polish into matte finish. The look on the right combines a matte with a french tip gel both in black. I must say the contrast of the same colors is impeccable. The ombre look is a popular one, combining two colors using a sponge, nail tools to draw designs or add lines and spots are a must have for nail fanatics. Metallic nail foils are great to add some shine to your fingertips. The gold and silver ones are my favorite. Adding a design or color on every nail is also a must do as well as spotted galaxy style. There is also a new type of three dimensional nail polish that can add a feathered texture or beaded texture like the black one below! Which is your favorite style of nail art?